Cookies. We love them. We love baking, sharing and eating them. I always think of my mother, who was known for her beautifully decorated and crafted cookies, as we pull out recipes and cookbooks she used. 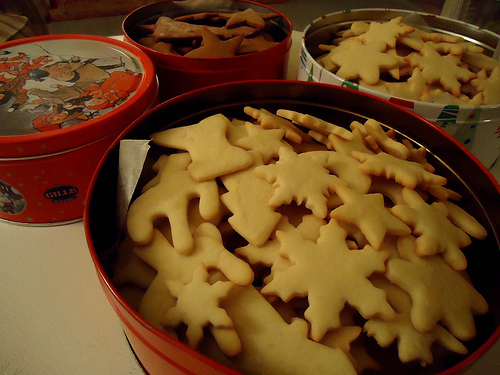 I learned early, that cookies can be very simple, but can also be elaborate works of art. We aim for somewhere in the middle of that, in the land of mmmm, delicious cookies and still having lots of fun (yes, my mother could overextend herself on the cookie front, it's true). Still, we do bake. A lot. When one type is completed and stored neatly in the vintage cookie tins we've collected over the years, we always find reasons to make more (that reason primarily being, more cookies.) And when I say we, I really mean Alex and the kids. 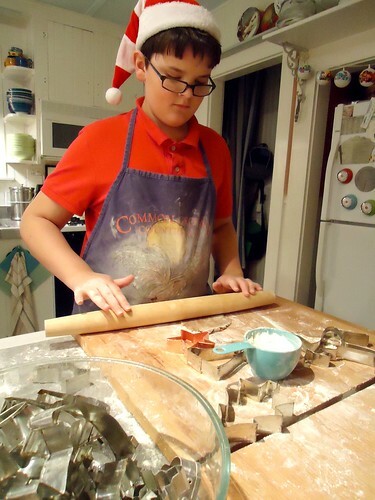 I bake cookies all year long and while I do make some for our Yuletide (like the Boxing Day Shortbread*), it's Alex, Adam and Olivia who do the bulk of the cookie baking during December. 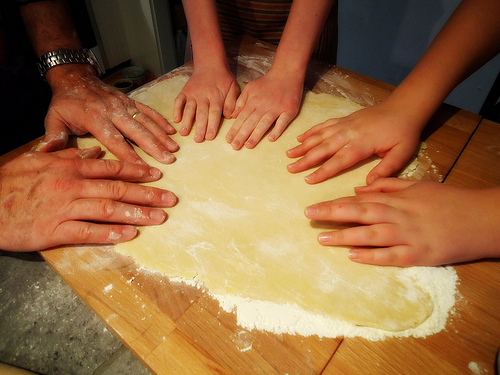 So today looked like this: my family, in the kitchen, hands in dough, notes being written in books, aprons covered in flour. For part of the day, Olivia and I ran a few Elfish errands, and it was just Alex and Adam in the kitchen. They just had to make up a big batch of Peppermint Pinwheels. It simply wouldn't be Yule without them. Thoroughly cream butter, sugar and peppermint extract in large mixing bowl. Divide 1 egg and refrigerate egg white for later. Add yolk and remaining egg; beat until light and fluffy. Stir in milk. Sift together flour, baking powder and salt; blend into creamed mixture. Divide dough in half. To half of the dough, add 10+ drops of food coloring and blend well until color is uniformly pink. Shape plain and white dough into to separate balls and wrap well. 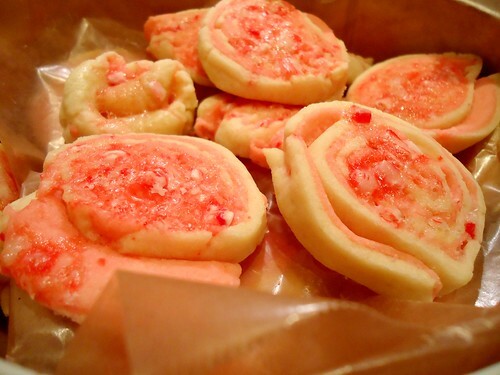 Refrigerate both pink and plain dough for 2 hours. Roll out plain dough onto floured board and shape into rectangle, 1/8 inch thick. Sprinkle with crushed peppermint candy. Taking the pink dough, roll out onto floured surface, a similarly sized rectangle. You may need to do the dough in two batches. Layer the pink on top of the plain dough. Trim the edges to match. Press gently. Along the long side, start rolling the joined layers into a roll. Once in a cylinder, slice into 1/4 inch thick cookies. Place parchment paper onto cookie sheets and place sliced cookies about 1 inch apart. Using a fork, whip the remaining egg white and then brush each cookie with the egg white. Sprinkle crushed peppermint candy on each cookie, brush with additional egg white, as needed. Bake for 10-15 minutes. Remove from oven before the tops brown. Cool in pan for 5 minute or less. Remove from paper to wire cooling rack to avoid having cookies sticking to pans. *Boxing Day Shortbread (or Sara Perry's Buckingham Palace Shortbread from her wonderful book, Holiday Baking). The recipe is also here.